The call of a bird wakes Romeo and Juliet just before dawn, but Juliet claims the bird is a nightingale rather than the lark greeting the day. Romeo says he's willing to pretend it's night and die, just to be with Juliet. Earlier Romeo and Juliet tried to rename each other. Now they try to rename things in the world to stop the day from dawning. Juliet stops pretending. She says it's day and Romeo must go. Juliet is willing to die for love. Romeo wants to die for love. The Nurse enters and warns that Lady Capulet is approaching Juliet's room. Romeo hurries down the rope ladder. To Juliet, standing on her balcony, it looks as if Romeo is descending into a tomb. Perfect example of the social world interfering in Romeo and Juliet's love, leading to a foreshadowing of their fate. Lady Capulet enters, and soon begins to curse Romeo as the "traitor murderer" (3.5.84) of Tybalt. Juliet speaks so cunningly that it seems like she's agreeing with her mother, but in reality she is expressing her love for Romeo. Juliet uses language to hide her meaning from her mother. Word play can keep private thoughts safe from the public world. Lady Capulet reveals the plan for Juliet to marry Paris on Thursday. Juliet refuses to marry Paris just as Capulet enters. He is furious at her ingratitude. Capulet says she'll marry Paris on Thursday even if he has to drag her to the church. And if she still refuses to marry, he will disown her. Juliet begs her mother to step in, but Lady Capulet follows Capulet out the door. Yet Juliet can only hide from the public world; she can't overcome it. As a daughter, she has no right or ability to stand up to her father. Note how furious Capulet gets at the mere suggestion of disobedience. Juliet asks the Nurse for advice. The Nurse says that Romeo is banished and unlikely to return, so she should marry Paris. The Nurse tries to ease the blow by saying that Paris is better looking than Romeo anyway. Juliet privately vows never to trust the Nurse again. She comes up with a lie in order to go see Friar Laurence, telling the Nurse that because she displeased her father she needs to go to confession. Just as Friar Laurence can't understand Romeo's passion, the Nurse can't understand Juliet's. The Nurse thinks one handsome man is as good as another. Juliet, in contrast, insists on the uniqueness of her love with Romeo. Florman, Ben. "Romeo and Juliet Act 3, scene 5." LitCharts. LitCharts LLC, 22 Jul 2013. Web. 24 Apr 2019. Florman, Ben. "Romeo and Juliet Act 3, scene 5." LitCharts LLC, July 22, 2013. 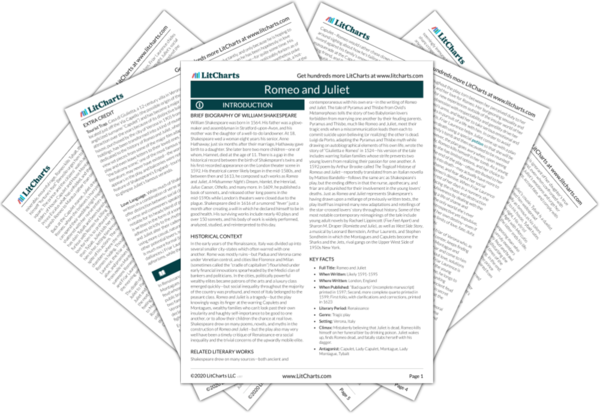 Retrieved April 24, 2019. https://www.litcharts.com/lit/romeo-and-juliet/act-3-scene-5.